Hello Kitty Shinkansen. Just gonna leave that here. It appears we’re not going to get a formal study of building the Midtown Station on 8th Avenue, much less further up First Hill. However, a little searching can give us an idea of costs and benefits. Call it the discount version of the study Sound Transit will refuse to give us. Back in 2010, Sound Transit spent $27m to tunnel under I-5. Two undercrossings thus price out to $62m in 2018 dollars. 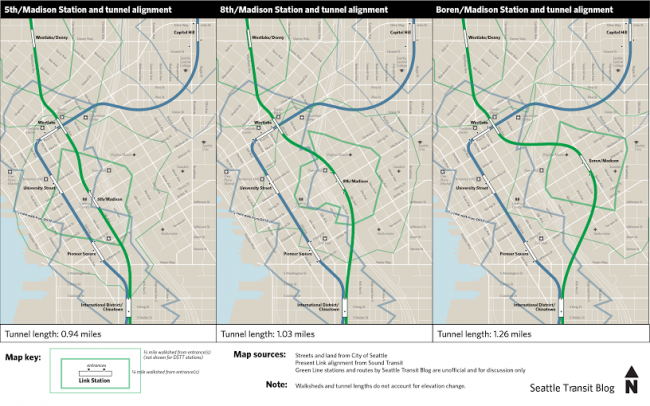 Oran’s mapping software estimates an 8th & Madison alignment as adding roughly 0.09 miles, or 475 feet, to the length of the tunnel. Taking the experience of the Beacon Hill Project, a TBM can cover 50 feet per day, so that’s 10 more days of boring operations. This source suggests TBMs cost about 5m Euro per month, so that comes out to roughly $2m in additional expenditure. Lastly, an 8th Avenue station would be deeper than at 5th, and therefore more expensive. Back in 2005, the entire Beacon Hill project (both station and tunnel) cost $305m, which is $413m today. Roosevelt Station cost $151m in 2018 dollars, and can be considered a floor for what the 5th Avenue choice would cost. Thus we can place a ceiling on the station cost differential of $252m, and estimate the total cost of moving the station from 5th to 8th at no more than $316m. Ridership predictions are difficult, even with a professional model. They become harder when it’s not clear what to measure: is it enough to compare boardings at each location? What if those riders are cannibalized from the existing Link stations? If they’re taken from the bus network, how do we measure the improvement in quality of life for those riders even if they don’t take a car off the road? 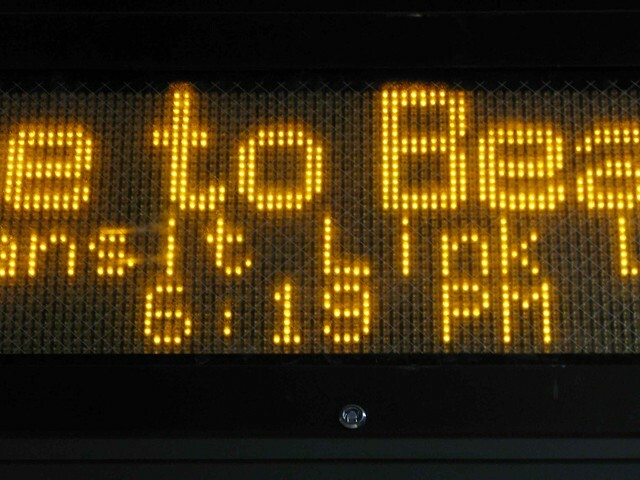 The nice thing about BRT is that it doesn’t take forever to open. After we approved BRT on SR522 in 2016, it will open in 2024. You can also participate online. BART extended further east this weekend using DMUs. Deep dive from the Times on bike lane costs [$]. Spoiler: most of the money wasn’t for the bike lane. Bike lanes are for cars. Amen. Search for new SDOT director underway. Take the survey. Read Tom’s take on what the new director needs to do. Biking may expose you to air pollution. After an auspicious start, NYC’s new transit chief seems to have gotten caught in the DeBlasio-Cuomo petty crossfire. NY’s transit riders be the worse for it. Golden Gate Transit routes entering a low ridership death spiral. Marin County is the worst. What will happen to Seattle’s sidewalks with the recalculated Move Seattle levy? Boulevards of Death: unsafe arterials in America. Rainier Ave gets a shout-out. 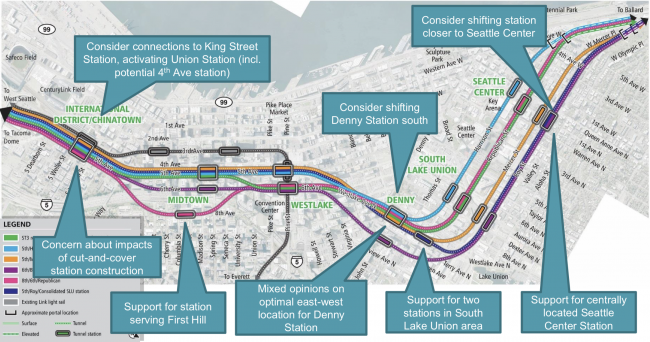 I have long been skeptical that Sound Transit would build a First Hill light rail station. When the staff doesn’t want to do something, it takes a combination of grassroots pressure and an aggressive leader to make them do it. For over a year, there was no organized campaign and no elected champion for the neighborhood. Threats to project revenue and a desire to quickly eliminate alternatives worked against introducing new ideas. Although we always knew the ST sausage making process was subject to the whims of coalition-building, we at least believed we understood it. The First Hill saga reveals that there’s no real process at all. Frank has already covered most of the hypocrisy: a legal standard for deviating from the representative alignment never used in previous Sound Transit measures, missing from assurances in 2016 when they needed your vote, and indeed ignored in this very same meeting; summary rejection due to increased costs, as other alignments passed with vague hopes they could find the money; and concern-trolling about the cost and effort of studying a single First Hill alternative, immediately followed by waving through six ways to get into Ballard. I am not a lawyer, but applying spurious and inconsistent standards is probably better grounds for a lawsuit then any invented constraints from the ballot measure. But perhaps the most astounding result is that First Hill did organize, no institutional opposition emerged, Joe McDermott and Sally Bagshaw recognized the enormous potential of the station, and still the Sound Transit staff and its elected allies found reasons to dismiss this alternative that apparently didn’t apply to any other part of town. Both ordinary residents and big institutional employers on First Hill showed up to testify, and what they said was well-informed and accurate. Most of Sound Transit’s foul-weather friends explicitly urged a close look at First Hill’s potential. Even the DSA — arguably the injured party if the station moved outside the downtown core — supported the effort. And yet, that coalition got much less out of Sound Transit than a bunch of angry Kirkland residents that flouted their City Council to keep transit as far from their homes as possible. The Sound Transit Board will be briefed on the recommendations this afternoon, and gets the final say next month. Though the chances First Hill gets to Level 2 analysis are slim, a Sound Transit analysis would not be likely to favor the station anyway. 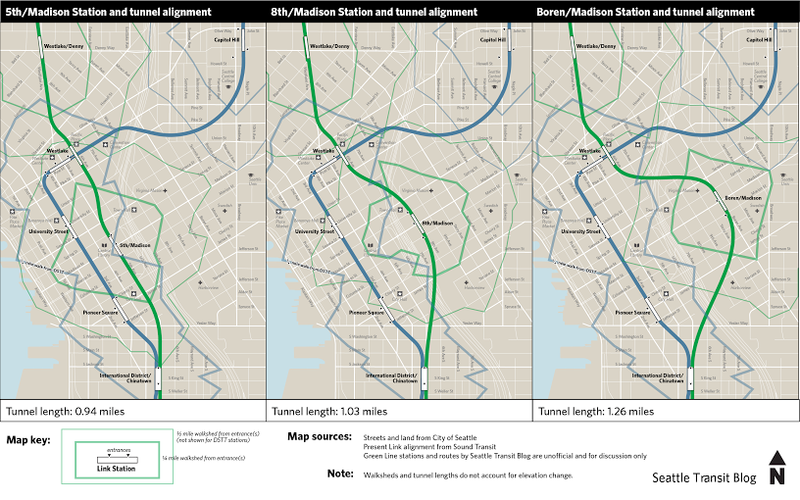 A line that poaches many of its riders from the existing train can look good in a superficial study, one that doesn’t place adequate weight on riders added to the system from an extraordinarily dense housing and jobs center. Few who witnessed last Thursday’s motivated reasoning would expect the planners to make this subtle distinction and choose correctly. First Hill’s organizing efforts are likely to result in some sort of concession to the neighborhood, as the Streetcar as currently implemented is largely a failure. This might involve Madison BRT, already planned to be less reliable or frequent than Link, and with another round of Durkan value engineering likely ahead. Even in the best case, First Hill will be an additional transfer from most regional destinations. 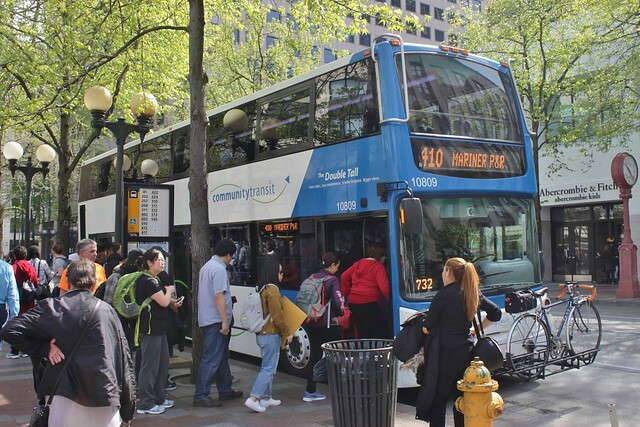 To take a simple example, hospital workers taking Sounder up from South King County will have to choose between a two-seat ride from King Street and a circuitous, congested route on the streetcar. Those people weren’t represented Thursday, save by Dow Constantine, and they’re among those who will pay the highest price. In September 2014, when the median single family home price in Seattle was $431,000, the city council passed a resolution aimed at increasing Accessory Dwelling Units (ADUs). In 2016, when the home price was $513,000, neighborhood activists sued to stop the policy, forcing the city to conduct an environmental impact statement (EIS). Now, in 2018, as the single family home price cruises past $800,000, the Draft EIS has been released. Erica has the a great explanation of how the EIS functions as an indictment of exclusionary zoning. It states pretty plainly that detached single family houses are only affordable to the wealthy, and allowing more diverse housing types in single-family zones would (a) not materially impact parking, (b) spur the production of thousands of affordable units, (c) result in fewer tear-downs of existing houses, and (d) make single family zones more diverse and inclusive. 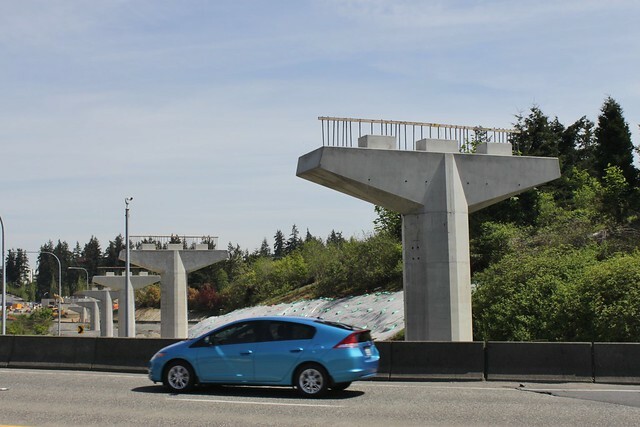 Early Tuesday morning, a construction foreman for Kiewit-Hoffman was killed after falling 30 to 40 feet from a column on the East Link guideway, near the 148th Avenue interchange on State Route 520 in Overlake. 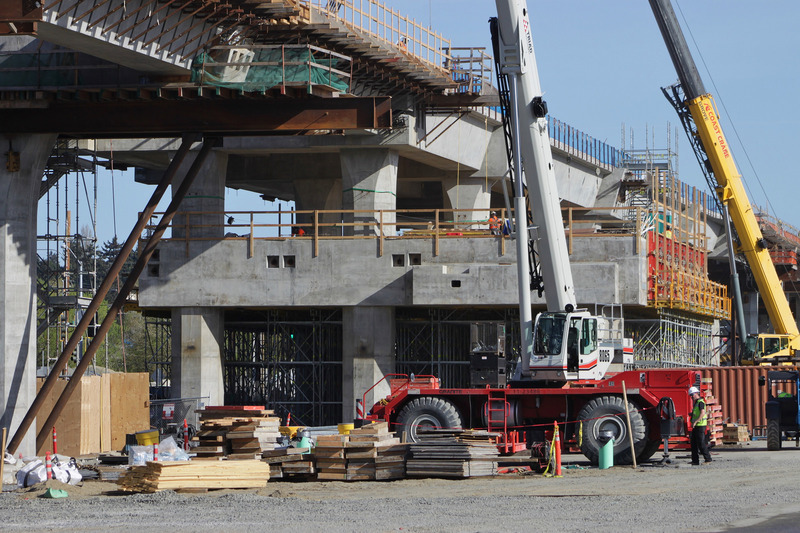 The accident, only the second fatal incident at a Sound Transit construction site, triggered a one-day halt in girder work on the Overlake segment and an investigation by the Department of Labor and Industries according to KOMO. 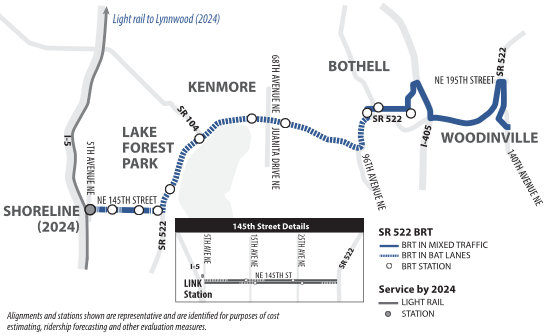 The Times reports ($) that there are 100 workers involved in the Overlake segment of the East Link project and they will be given time to mourn before returning to work and being interviewed by investigators. In statements to KING 5, Kiewit and Sound Transit sent condolences to the worker’s family and friends and their shared commitment to a safe work environment for employees and the public. We at STB would also like to express our condolences to the worker’s family and friends and express our gratitude towards those who are helping build out our regional transit system. 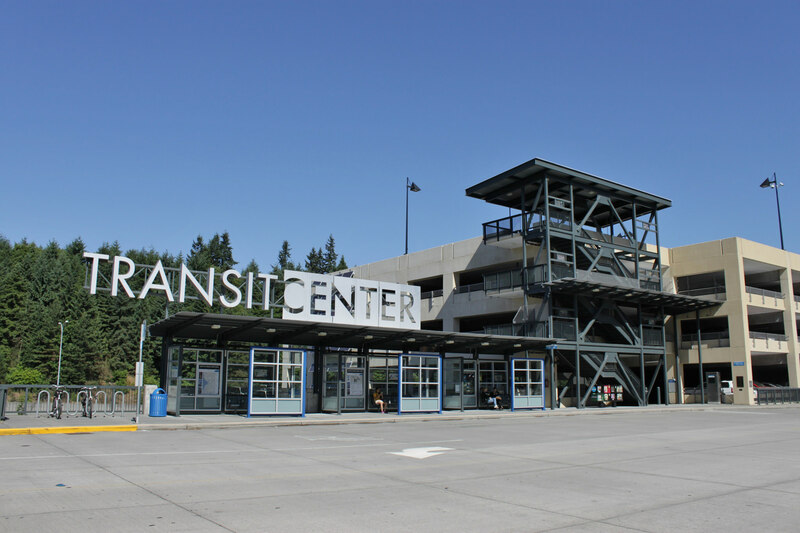 After returning with additional modifications, Metro gained approval from the Burien City Council for RapidRide H improvements (previous coverage here). See Omaha Sternberg on Twitter for the play-by-play. You can read Metro’s full proposal (Alternative C) on the Burien website (PDF). 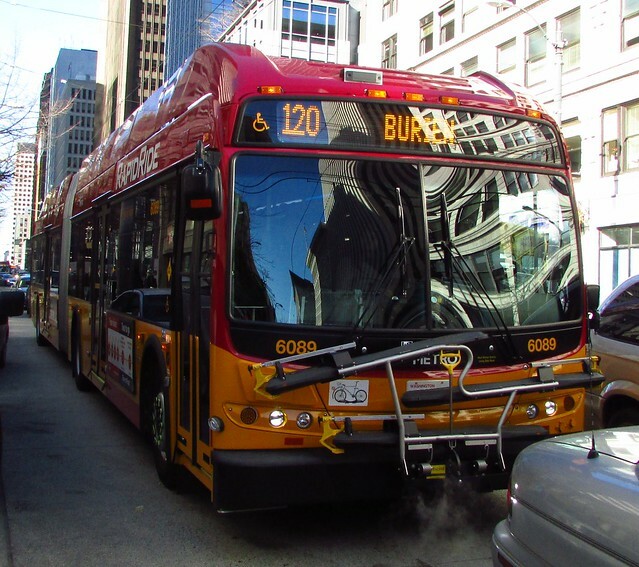 RapidRide H, the upgraded version of Metro Route 120, will use Business Access and Transit (BAT) lanes for much of its route through Burien, thanks to the rechannelization scheme that passed the council last night. Ambaum Way SW, which is five lanes wide in many areas, will get BAT lanes, two general purpose (GP) lanes, and a center turn lane. Previous alternatives proposed more aggressive rechannelization. The new Alternative C has no real road “diets,” since no lanes are being removed, they are simply being repurposed for BAT use. The main exception is a short, curved stretch of Ambaum Way, which will go from 4 lanes to 3. I’m not personally familiar with this stretch, but the fact that someone thought to put concrete barriers between the road and the sidewalk certainly suggests that it has serious safety issues. To ameliorate motorists’ concerns about being stuck behind the bus, Metro will avoid placing bus stops in areas where the road narrows to “only” 3 or 4 lanes. That will mean stop spacing approaching half a mile in some spots, which is normal for rapid transit but has not been the norm for RapidRide. The new alternative will only slow cars by 5-8%, while decreasing bus travel times by 13% in both directions. New pedestrian crossings and signals will further enhance safety. 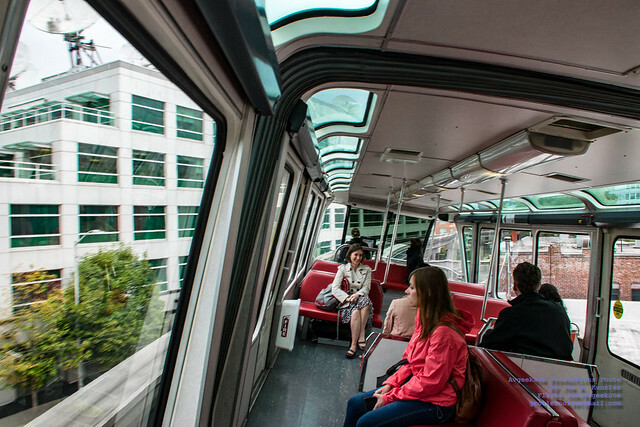 RapidRide H will launch in 2020; Metro projects 12,800 riders by 2023. 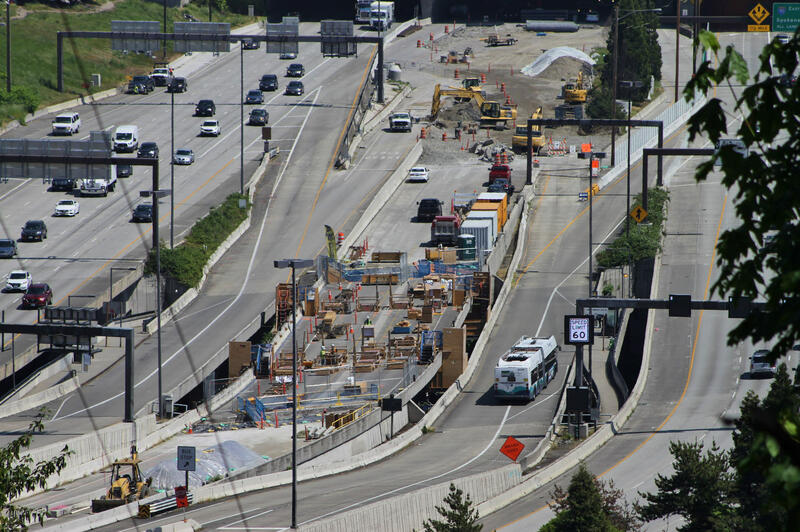 Northgate Link is slowly inching its way towards completion, still scheduled for June 2021, but a substantial amount of progress can be seen from street level. This photo tour will hopefully be the beginning of a semi-regular series to track construction progress on Link’s extensions, for the benefit of readers who aren’t up for a long journey to the future stations or don’t continually refresh the construction cameras every few minutes. If you’d like to do your own photowalk near light rail construction, I’ll be offering tips and my recommendations for good views. As a general precaution, always stay in open public areas, keep your hands off fences, and listen to on-site workers to avoid misunderstandings. Photographers with large cameras tend to make people nervous, so you may run into occasional conflicts, but often people are open to a little small-talk if you aren’t acting suspiciously. Last Thursday, the Sound Transit 3 “Elected Leadership Group,” a supergroup of local elected officials (the Infinity War of transit oversight, if you will), met to consider which of Sound Transit’s Level 1 alternatives should advance to Level 2. The ELG’s recommendations, like those of the nonelected “Stakeholder Advisory Group,” are nonbinding. The final decision will be left to the ST Board (which includes several ELG members). The meeting centered on the SAG’s Level 1 feedback with regards to West Seattle, SODO, Downtown, and Ballard, but the most contentious discussion involved whether to move forward with analysis of an 8th & Madison station on First Hill. 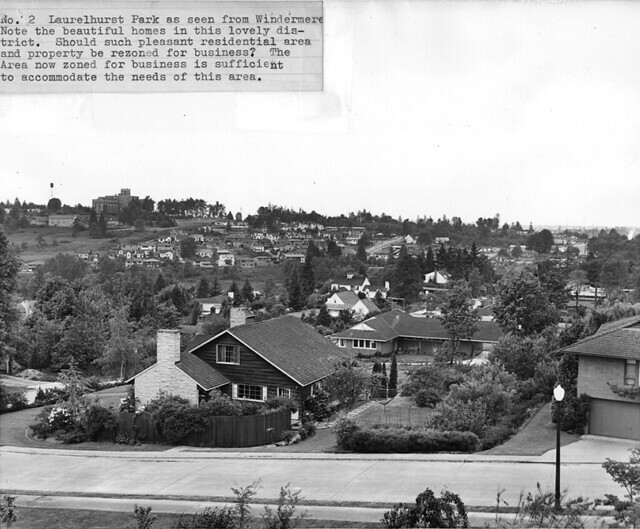 Seattle Councilmember Sally Bagshaw and King County Councilmember Joe McDermott both expressed interest in serving the First Hill neighborhood, noting it has the highest residential density and lowest car ownership in the city (and probably the state?). However, the deeper First Hill station would, according to staff, present construction challenges (including two I-5 crossings). More controversial, however, is whether moving the station to First Hill would qualify as a bait-and-switch in the eyes of the voters (cost and ridership would matter as well). Sound Transit’s general council, Desmond Brown, testified that the question is whether a voter could look at the station and agree that it was what they voted for. On the one hand it’s just a couple of blocks (from 5th to 8th Avenue), but it would mean moving the station to a different urban village, which could be seen as a material difference. The Limited Access Connection project’s goals include addressing mobility challenges for those with limited or no access to transit; finding solutions for the growing problem of at-capacity Park & Rides; reducing road congestion by getting more people on transit; guaranteeing a ride home for those traveling outside regular bus service hours; and meeting the transportation needs of more remote riders. These objectives are unique in that they are focused on helping connect people to/from transit. The concept is pretty simple. If you’re in one of the shaded areas, you can request a Lyft ride with a special promo code, as long as your destination is one of the designated transit stops. Similarly, you can travel from one of those hubs to one of the areas. Riders are limited to a total of 48 free rides per month. Regrettably, the rules get a bit more complicated than that. 4 of the promo codes apply seven days a week, while 2 others (18RAIDERS and 18FIFEPUY) are weekday only. The hours are different for each: most cover the bulk of the day, but 18RAIDERS is only from 8:30-10:30pm when bus service to the campus stops. Creative ways to solve last-mile problems are great, and spending $205,000 on this sure beats building 2 or 3 park and ride spaces. I doubt that having this service be entirely free is sustainable, but one hopes it’s successful enough for PT to find some way to keep it going. Whether or not things pencil out in 2018, this is probably the future of exurban and rural transit. 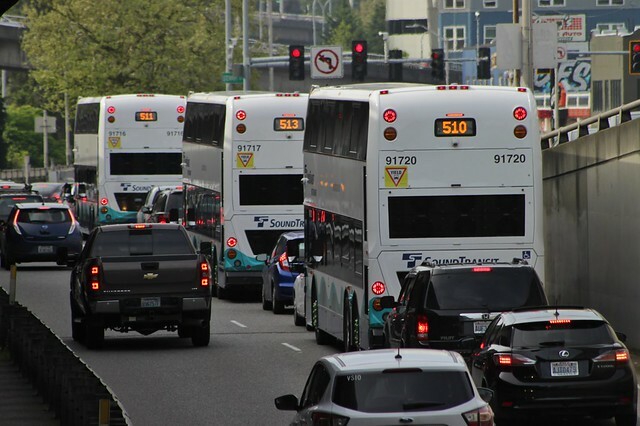 Assuming that automated cars are ultimately workable, it’s hard to see why transit agencies would continue to operate traditional buses on low-volume coverage routes, even as the major trunk lines will still require large vehicles. Whether those vehicles are best actually owned and maintained by the agency or a contractor is an open question. This and the 10 other pilots nationwide may help to answer it. Wheelchair-accessible vehicles are available by phone, though not through the Lyft app. Smartphone-less riders can also use the phone or a webpage. 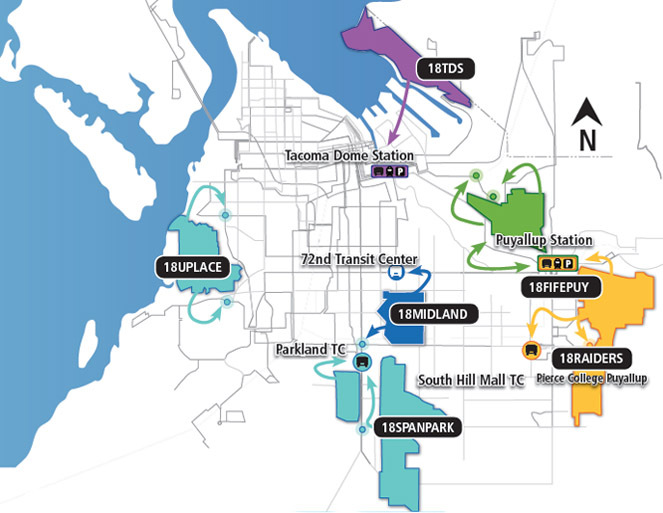 On Monday, Sound Transit announced that it had received a $75 million Small Starts grant from the FTA for the Tacoma Link Extension, which will extend the current streetcar-like Tacoma Link through the Stadium District and Hilltop neighborhood west of downtown. This project isn’t to be confused with the Tacoma Dome Link Extension, which will bring real Link light rail trains from Federal Way to Tacoma Dome Station, where passengers can transfer over to Tacoma Link. The Small Starts grant was originally approved by Congress last year and will cover about a third of the project’s $217 million budget, which includes contributions from Sound Transit 2 ($94 million) and the City of Tacoma ($48 million). Sound Transit says that the grant will enable construction to begin later this year and wrap up in 2022. The project will extend Tacoma Link by 2.4 miles and add six new stations, plus the relocated Theater District station (which will be renamed to Old City Hall), serving several hospitals on “Medical Mile”. 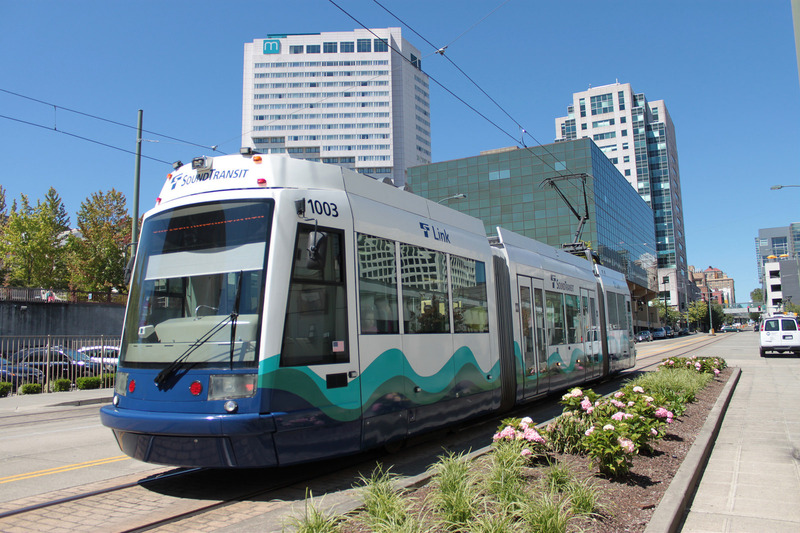 Once the Hilltop extension is completed, Tacoma Link trains will run at a frequency of 10 minutes and begin charging a fare, which is currently waived thanks to a donation from the Tacoma Business Improvement Area. Could the Olympics overload Tokyo’s subways? Open a Page 2 account. Write an article, save it in draft, and email contact@seattletransitblog.com. Do NOT publish it. If it meets our standards, after some editing, we’ll publish it as a guest post on the front page. If there is a sustained rate of guest posting, on the order of once per month or greater, the writer will be invited on staff. Being a volunteer staff writer has a few advantages. You get direct access to the front page. Most enthusiasts would probably enjoy access to the staff group, which has a lively internal communication channel and a few social events. I’ve found that the ability to write well on this subject and the drive to do so, for free, on a regular basis is a rare combination. If you think you fit the description, it would benefit the organization and the transit community for you to give it a shot.